October 2018: The top-selling electric car brands in Germany were Volkswagen, Smart and Renault with the VW Golf, Zoe, Fortwo and BMW i3 the favorite electric car models. January to October 2018: Smart remained Germany’s best-selling electric car brand followed by Volkswagen, Renault, Kia and BMW. The favorite car models of the Germans thus far in 2018 were the Renault Zoe, VW Golf, Smart Fortwo, Kia Soul and BMW i3. During the first ten months of 2018, only 0.96% of new passenger vehicle registrations in Germany were electric cars. New electric passenger car vehicle registrations in Germany in October 2018 increased by 55% to 3,390 cars and a 1,34% market share compared to 2,180 cars and a market share of 0.8% in October 2017. Electric cars took an uncharacteristically large 1.2% of the German new car market in September 2018 and 1,34% in October but this was largely due to a 20% decline in the total German new car market in September and 7% in October due to the introduction of new emission control regulations that left many manufacturers temporarily unable to register new cars. In September, registrations of Audis were down by three quarters and VWs more than 60% – see 2018 Q3) Germany: Best-Selling Car Brands and Models for more details. More clarity on the future of diesel cars, and especially older diesel cars, in Germany may help the market during the final quarter of 2018. Huge premiums are offered by manufacturers for exchanging older diesels for new cars but it remains unclear how many of owners would opt for electric cars. Renault for example already announced a €5,000 exchange premium for the Zoe. During the first ten months of 2018, only 24,574 new electric passenger vehicles were registered in Germany for the first time, or a market share of only 0.9% of the total German new car market compared to 18,613 and a market share of 0.6% during the first ten months of 2017. In October 2018, Volkswagen for the second consecutive month was the best-selling electric car brand in Germany after lagging behind mostly Smart and Renault earlier in the year. Volkswagen took a commanding 25% market share of the German new electric car market. Smart was again second followed by Renault. Hyundai moved up two places to fourth, with Nissan slipping to fifth and BMW to sixth. Jaguar enter the top ten at the expense of Audi. January to October 2018: Smart remained comfortably ahead of Volkswagen and Renault. Despite weak sales in October, Kia remained ahad of BMW. 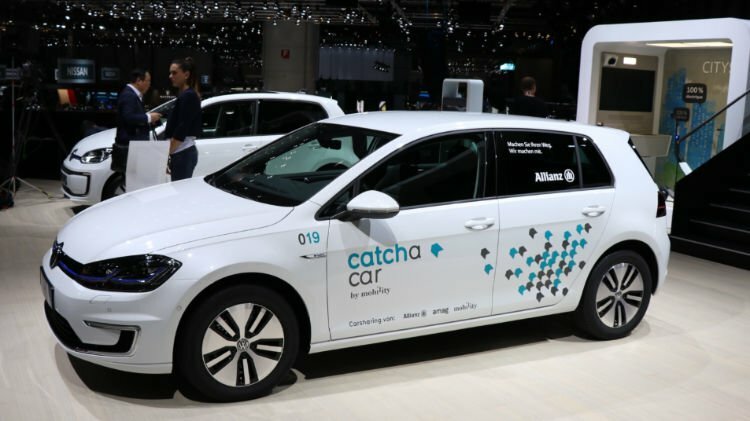 October 2018: There was always a sense of inevitability that the VW Golf would be the leading electric car model in Germany and in September 2018 the Golf finally became the clear market leader and extended the lead in October. The Golf outsold the Zoe in March 2018 by 11 cars but in September 2018 the Golf finally took a commanding lead and 18% market share and increased that to 23% in October. Year-to-date 2018 the Golf is still behind the Zoe but reports that Volkswagen increased electric Golf production by a third give a strong indication of which car is likely to be on top over the full year. The Renault Zoe was again the second most-popular electric car in Germany in October 2018. The Smart Fortwo regained third place while the BMW i3 slipped back to fourth with the same sales as the Nissan Leaf. The Smart Forfour re-entered the top-ten list at sixth. The Hyundai Ioniq and Hyundai Kona were seventh and eighth withe VW Up again in the top ten. The Kia Soul rounds out the top ten with low sales – it topped the ranks in July. 1-10/2018: During the first ten months of 2018, the Renault Zoe remained the top-selling electric car model in Germany but the VW Golf is now only seven cars behind. The Smart Fortwo is still in third place but the Forfour and Kia Soul are both falling behind. The BMW i3 sales remain remarkably stable and may be more due to sales being production rather than demand led. Conventional wisdom holds that carmakers are sill selling electric cars at a loss and thus not keen on increasing sales at current market prices. The German motor press reported very long waiting times for electric car models. It will be interesting to see if this continues when far more expansive models actually make it to market rather than the auto shows. Audi started to take reservations (€2,000 – no refunds) for the e-tron with prices starting at €80,000 (but good luck getting one without more expensive options) and no firm delivery date (or final price).